Interested in Making a Perpetual Self-Renewing Income? Want to lead a recession proof life? Let me guess! You are HERE reading this web page because you have figured out that it is probably a lot easier to run a business that runs itself than micromanaging a site that specializes in selling goods or services. You have probably also figured out that getting that credit card number from your customer and then charging them a monthly fee is probably a good idea. Paying thousands and only making hundreds is no way to live when it comes to internet marketing and that has resulted in my book. I titled this report this for a specific reason and that is that most of you never even thought for two seconds that you could have your own bona-fide membership site up and running AND making money in so little time. Well I am here to tell you it is true. I wrote an entire book dedicated to the topic because I have done it and I am a financial success who makes more than three grand a month with just one of these sites. No matter what kind of online business you are running it is important to comprehend that there is a vast difference between making money online bit and building a business that renews itself. I know that when I was a beginning marketer my main concern was that I could not afford to set up this type of site. I thought I would set it up, run out of money and then end up with a dead site floating around in virtual space. I also made the mistake of thinking that building my own membership site would be a hell of a lot of work. I was wrong. Right now there are some extremely professional membership software programs available on the market that range in price from less than $30 right up to five dollars short of $30,000! And in 1 Month Membership Riches I give you links to the programs that can totally automate a membership site for you. You dont need any software to set up a membership site at all! In fact you dont need anything more complex than an autoresponder to set up a decently converting membership site! That is because your members dont care HOW you have set up your site. All they care about is that it functions easily and quickly. This is because the strength of a membership site is about its content and not really about anything else as long as you keep giving the people what they need! In my eBook, 1 Month Membership Riches, I outline several reasons why you might want to open your own information site even if you have an online or offline brick and mortar type business (meaning that it sells goods or services) in place anyway. You dont even have to sell a product! Learn how to make a killing selling them unique information! In this eBook I outline what kind of information your site should provide so that your customers find you absolutely irresistible. What the essential resources are that you absolutely need to have in place before you begin building this type of site. How to focus the design of your website so it meets your goals when it comes to converting new list members. Of course none of the above is just "add water and stir" and ta-da you have big converting membership site! Are you ready to get creative and make money selling information? In this book I AM presenting you with a formula. By the time you are done you will know how to conceptualize and build a content rich site that encourages sign ups. Still getting creative with your business is what putting together an information site all is about. That is because you are selling an enrollment and not a solid product. This means that you need to leverage what it is that you already know about your customers and what they want if you really want to convert them to members. How to narrow down the focus of your membership so that you have a niche that "mines an inch wide and a mile deep"
How to build an entire site around information you find for free without violating anyones copyright. How to use a very creative and simple approach to find out exactly what it is your customers want to see on a membership site and what kind of information they would be willing to pay for! I promise you that I tried to make this book the most concise and easiest to read book on the subject of creating a converting membership in less than a month. Everything that I discuss in this book has been put on trial and tested by myself. I know that these strategies work! If you follow the formula for success that was developed by me you will start earning money in the one month that I have promised! Moreover the system I have created self-sustaining and improves with effort. The more creativity and imagination you put into it the more money you will make! My methods are fool proof. You can build a self-converting business empire that can viably ring in thousands of dollars a month using next to no startup capital if you follow the methods in 1 Month Membership Riches. Yet another quality of my methods is that your website practically runs itself. You do not have to monitor it day and night. It runs on autopilot. Its time to get in the know like thousands of other satisfied information marketers and order my eBook! After you order and pay for this book you will get instant access to a URL that allows you to download my eBook. You could be putting together your own converting membership site within minutes. There is no wait for the book, no shipping costs and you can get the information that you need seconds from now. Try it risk free today! If you purchase today, your purchase is 100 guaranteed. If after reading the eBook, you aren't on the true path to creating a membership site, just ask and I'll be glad to give you a full refund. If the suggestions put forth in this report doesn't get your site moving as YOU want it to, I'll refund 100 of your purchase price, no questions asked. Why am I taking all the risk on myself? 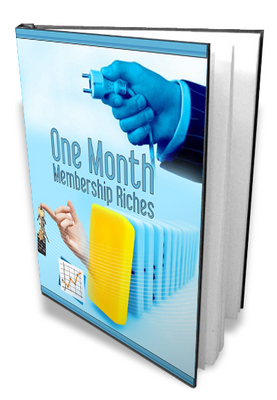 Because I believe in the methods that I have written about in One Month Membership Riches.